Our world is a crowded and hyper-connected place and it is becoming more crowded and hyper-connected every day. The challenges of our world call us to evolve as a species at a pace that has never been necessary before - not in our physical attributes, not in our emotional capacities, not in our mental capabilities, and arguably not even in our use of technology to master the environment and harness its resources. We are called to evolve in the ways that we interact with each other as fellow inhabitants of Earth. Being Relational details seven ways of being in relation to others that capture the heart and soul of all that is self-help. It is grounded in method, and is supported by relational conflict theory and brain science findings. The seven ways of being that promote quality face to face interactions and positive transformation are rooted in teachings from many sources – conflict resolution, negotiation ethics, neuroscience, multiple faith traditions and numerous popular self-help and business books. It is a unique collection of teachings that focus on what happens in human interaction. This unique approach is inspired by thousands of broken relationships that the Senfts have mediated and coached back to strength and connectedness over the last two decades..
Our world is a crowded and hyper-connected place and it is becoming more crowded and hyper-connected every minute. With continuous messaging through media outlets emphasizing conflict and desperately competing for our attention, our world seems full of struggles over resources and power and struggles between competing beliefs and ideologies. We are living in a time of turmoil between religious groups, greater political polarization, intractable impasse in Congress, greater gaps between haves and have-nots, greater divisions within families, cultural preference of divorce over reconciliation, and escalating conflict on the streets of our cities. The challenges of our world call us to evolve as a species in ways that never before have been necessary: not in our physical attributes, not in our emotional capacities, not in our mental capabilities, and arguably not even in our use of technology to master the environment and harness its resources. But rather, the challenges of our world call us to evolve in the ways that we relate to each other as fellow inhabitants of Earth and, by extension, how we relate to all living things on our planet. In a crowded and hyper-connected world, interaction with other people is constant in your daily experience. It takes place in many forms—face-to-face, phone, letter, press release, media reports, email, Facebook, Twitter, Snapchat, Instagram, YouTube, and so on. It takes place on many levels: person-to-person (one-to-one), person-to-group, group-to-group, political party-to-political party, government-to-government. Every interaction is a negotiation. You might not think of it as a negotiation when you are in it, but fundamentally, when you act or communicate in any way that affects another person, you are negotiating with them. You are seeking to affect and influence their behavior or perception of you, and whether you connect with them or not; often they, in turn, are seeking to affect and influence your behavior, your connection or perception of them, as well. Many of your interactions may seem trivial, purely in the nature of simple exchanges of information or money for goods, but they are negotiations nonetheless—and your most intimate exchanges, though you might refer to them as conversations, these too are negotiations. The critical issue for us as a species is how we negotiate, how we connect, how we relate. The premise of this book is that how we negotiate, and more importantly, who we are as we negotiate life with others, is at the root of our desperate realities and our conflicts large and small. It also is the source of a great hope we have for the future and a way we can thrive in our crowded and hyper-connected planet. However, in this time of conflict, improvement in our ways of interaction is not only a hope and dream for the future, but an urgent need now. So is this just another book on negotiation or conflict resolution? There are hundreds—many written by great scholars who have spent their careers studying the dynamics of negotiation and conflict. How can this book add to and advance your understanding? The ways that we call Being Relational is a collection drawn from many sources, some familiar, some more obscure, that have come to us in twenty years of immersion in the study of conflict, the human experience of conflict, personal reactivity, and human interaction. We also owe a great deal to the thousands of people who have come to Baltimore Mediation's conflict transformation trainings that Louise has taught since 1994 and all of the insight and experience they have shared in those trainings. We can't claim that everything we offer is an original idea—how could it be? We do believe we can share a unique collection with a unique focus—on what happens in human interaction. Elements of some very popular and widely respected teachings are part of being relational, from Stephen Covey's Seven Habits and Fisher and Ury's Getting to Yes, to Bush and Folger's The Promise of Mediation and the Old Testament Ten Commandments. Our goal is not to invent some radically new idea, but rather to provide a synthesis of many ideas already out there, to organize them into a comprehensive approach that you as a reader can draw upon and use, check in on and grow into, as a way of being in relation to others—something akin to Ignatian Spirituality of Catholic Jesuits and the Buddha Dharma—but focused exclusively on how you interact with others and how who you are affects how you interact. Our hope is that the relational ways offered in this book will make you and those you interact with happier, healthier, and more content—because of the quality of the interactions you have and the impact your way of being has on you and on others. Our belief is that through widespread adoption of relational ways, together we can increase well-being and create lasting positive change for ourselves, for our families, and for our planet. We want to share with you something that has emerged for us through the years of our professional practice as mediators, and through our family life with five children living in the bubble of prosperity that is the East Coast of the United States. Something that we hear echoed every day in so many voices on Facebook, Twitter, in blogs, in lectures we hear on radio, in YouTube videos, in the multitude of self-help books, and even in magazines we read in the checkout line at the supermarket. Despite our great prosperity in America, especially on the East and West Coasts, there is a restlessness, an emptiness, and confusion. Millions are struggling to find a peaceful and fulfilling life for themselves and those they love. For too many, the way of life that we have held as the standard for so long is not working and in many ways it is toxic to the health of our souls and to the soul of our global family. We all live in different realities. For too many, a desperate reality is their daily experience. Poverty, lack of education, disease, and disability are just a few of the root causes of this despair. Some of these causes are completely out of our collective control, but much of what brings on suffering that can lead to despair can be affected, ameliorated, by the actions and choices of those who live in health and wealth. The choices made by those blessed few, the 'winners,' affect every person in our society. Let's clarify what we mean by 'winner' here. If you are someone who has many advantages in life—success or a clear path to it, an investment account, comfort, leisure time—we know you. We want this book to have meaning for you. Your success, or winning, has likely been achieved through a blend of hard work and discipline, plus advantages of the family and socioeconomic class you were born into. But regardless of the path to it, you have a life that others might only wish for. So your reality is a good one—right? Maybe, maybe not. Living in a desperate reality is not exclusively reserved for the poor and less fortunate. Those of us who are blessed to live in America with health and wealth know from experience; we too may live with despair or feel its presence as it lurks just outside of our experience. We see flashes of it in our lives, and as we encounter it, often many times a day, we must make the conscious choices needed to create the different reality that our nature craves—the reality of joy, abundance and love, not just for ourselves, but also for others. This book is about those choices and for each of us, choosing a different reality might mean a radical change. In the upper economic levels of American society, the desperate reality of life in a society that is ultra-competitive, where escalating lifestyle expectations drive desperate behavior, may have touched your experience. This reality has many dark and empty dimensions—from isolation, to insecurity and dissatisfaction in the face of success, to feelings of emptiness—despite the material abundance it springs from. It's certainly not pleasant to think about and perhaps you are thinking, 'Thank God that's not my reality!' But maybe there is a piece of it that is part of your reality. Maybe it is worth considering why that is so. Maybe you want to do something to change your story, to change your reality. Maybe not. You have options. You can make different choices—in what you do, in what you say, in what you think. This book is about those choices. We are not going to make the argument here in these pages that there is a problem by offering statistics and anecdotes to prove that our winning way of life is producing desperate realities. Others have done that and better than we can. We know that there is a problem, and we invite you to explore ways to address the problem, even if you don't believe there is a problem and you are happy and secure in your life and your world just the way it is. ©2015 Louise Phipps Senft and William Senft. All rights reserved. 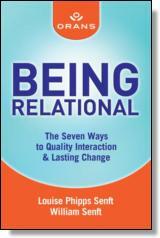 Reprinted from Being Relational: The Seven Ways to Quality Interaction and Lasting Change. No part of this publication may be reproduced, stored in a retrieval system or transmitted in any form or by any means, without the written permission of the publisher. Publisher: Health Communications, Inc., 3201 SW 15th Street, Deerfield Beach, FL 33442. William Senft (Baltimore, Maryland) is as an attorney, CPA, teacher, youth sports coach, mediator and ordained minister in the Catholic Church. He formerly served as a public high school English teacher and also taught Negotiation Ethics to graduate business students at Johns Hopkins University and Loyola University of Maryland. At Washington & Lee University, he was managing editor of Law Review, and is an experienced author of magazine articles and speeches. He preaches regularly at masses, funerals, weddings, and baptisms at the Cathedral of Mary Our Queen, a large congregation and seat of the Archbishop of the Archdiocese of Baltimore. He is a co-founder of the nonprofit ORANS: The Campaign for Relational Leadership, created for the purpose of developing leaders who will transform conflict effectively through quality dialogue and create lasting positive change. Married for more than 30 years to his wife and co-author, Louise Phipps Senft, William also is the father of five children.